The Isuzu Commercial Truck of America (ICTA) team consisted of Kiel Trout of RWC Isuzu Truck in Seattle, Wash., and Matthew Bertagnoli of Lynch Isuzu Truck in Waterford, Wis. Josiah Carr of Susquehanna Isuzu Truck in West Milton, Pa., attended as an alternate in case Trout or Bertagnoli had been unable to compete. The team was coached by Justin Ridings, ICTA technical training specialist. Isuzu Commercial Truck of America Inc. announced that its U.S. team of service technicians placed second in the 13th Annual Isuzu One Grand Prix World Technician Competition. 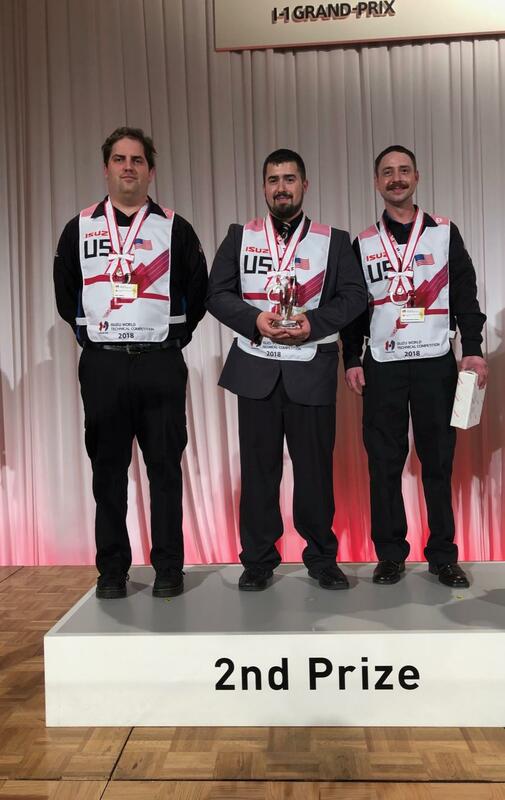 This marked the second year in a row that Team USA won the silver medal in the prestigious event, a grueling, multi-stage competition requiring outstanding performance on written examinations and in hands-on tests of vehicle diagnosis and repair skills. Prior to 2017, no U.S. team had made the top three in the championship's history. The event was held on Dec. 6 at Isuzu Motors Limited's training center in Fujisawa, Japan. Thirty-two countries from six continents competed. Teams were divided into two categories based on their home countries' emissions standards. Japan took the gold medal in Category A, in which the United States competed; the team from the Philippines won first place in Category B. "We are so proud of our team," said Shaun Skinner, president of Isuzu Commercial Truck of America. "Matt's and Kiel's diagnostic and repair skills represented ICTA beautifully and demonstrated that Isuzu service technicians in the United States can go toe-to-toe with the best technicians in the world." In the written test, the scores of each team's two members were combined; for the practical exam, each team had to find and repair a fault in an engine using the correct tools and methods in 45 minutes or less. Team USA notched the best written test score in their division but Team Japan eked out a win in the practical exercise to claim first place overall. Coach Ridings attributes the team's success to ICTA's investment in its Center of Excellence training facilities in Pittston, Pa., and Anaheim, Calif., as well as the institution of a North American version of the contest, which identifies the top three technicians in the company's dealer network and then hones their skills in preparation for the Isuzu One worldwide competition. "Our training programs, our Centers of Excellence, and events like this improve the skills of all Isuzu service technicians," said Skinner. "They help us reach our objective — to provide world-class service to every Isuzu customer."